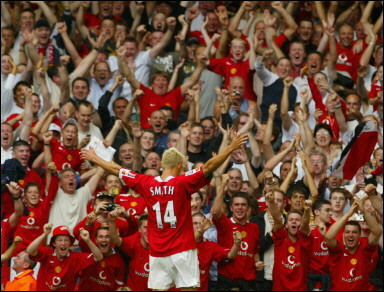 Alan Smith, affectionately nicknamed "Smudge" by his former Leeds fans, has been added to the United squad that is set to tour Asia. Amid all the rumors of him going to Boro or Newcastle or wherever, this is good news for the majority of United fans that love our Smudger. This man broke his leg and dislocated his ankle in one of the most horrific injuries I've ever seen (typically diving in to block a John Arne Riise free-kick) then worked his socks off for about a year to get fit again when some said his career might be over. He turned down the opportunity to get some playing time on loan, worked through the reserves and finally emphatically came back with this. The guy is 100% committed all the time. Some people have such a short memory. Only 3 years ago Smith was signed for a bargain 6 million pounds from Leeds United. He was a major contributor to Leeds' Champions League semi-final appearance in 2001 and scored 7 goals in Europe that year. He's not just got heart, he's got skill too. He famously turned down an opportunity to play for England to instead play for the United reserve squad. United have a talented striker that would start for the likes of Middlesbrough but is actually willing to be 3rd or 4th choice and help the team in whatever way he can. He's a fan favorite (especially with the ladies) and a great example to the rest of the squad with his commitment and heart. All he's asking for is a little backing and new contract that says we want him. Is that really too much to ask? 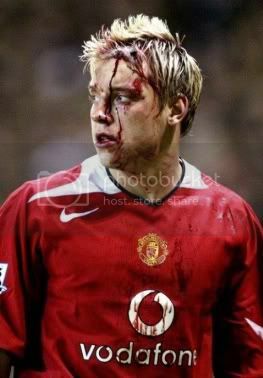 He needs to stay because, frankly, he's a true Red Devil (apart from that whole being from Leeds thing, minor detail). Smudge or Smudger, either or. 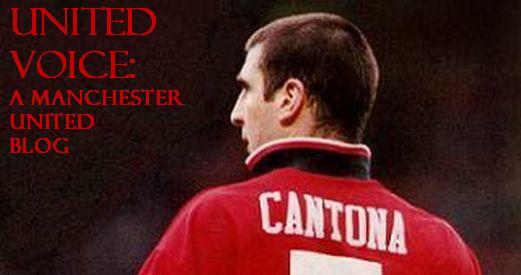 ohahcantona.blogspot.com; You saved my day again.